ORLANDO, Fla., Nov. 9, 2018 /PRNewswire/ -- VRsenal, the leader in attendant-free commercial VR systems, has partnered with Beat Games to launch a fully-automated Beat Saber Virtual Arcade Cabinet at the 2018 IAAPA Attractions Expo in Orlando, Florida. Just like a traditional arcade cabinet, VRsenal's Virtual Arcade Cabinet is a single machine that can go from shipping pallet to fully operational in thirty minutes, all with zero technical expertise or prior VR experience. VRsenal's Beat Saber cabinet has a footprint of just 30 square feet (2.8 square meters) and has been optimized for high throughput, high uptime, high ROI, and low maintenance. "We've had commercial VR products operating under real world conditions for over two years, so we've seen what works and what doesn't," said Ben Davenport, Founder and CEO of VRsenal. "Success in this arena requires a product that actually delivers on the high promise of VR, but without any of the hassle and inconvenience that currently comes with most commercial VR systems. It's not enough to simply deliver a fun experience, it also has to be affordable, profitable, easy to operate - and it needs to do all of this while never, ever, making anyone sick. The fact is - there's just no way to accomplish all of these things without a robust, fully-automated VR platform that's been carefully paired with highly repayable world-class VR content. That's why we partnered with Beat Games. Beat Saber burst on the scene in mid-2018 and instantly became a music rhythm phenomenon. People from every imaginable demographic love to play this game, and they love to watch their friends play. It's super social, and when you combine our compact, fully-automated Virtual Arcade Cabinet with a brilliant game like Beat Saber, operators are going to see significant revenue-per-square-foot numbers beyond anything ever witnessed in the LBVR space. We fully expect the Beat Saber Virtual Arcade Cabinet to be remembered as VR's PAC-MAN moment. In other words - this is VR's killer app." "VRsenal's design and execution of the Virtual Arcade Cabinet perfectly reflects our goal of making virtual reality approachable, accessible, and entertaining," said Jenna Seiden, LBE lead for Beat Games. "Beat Saber appeals to a mainstream audience, to anyone who likes rhythm, music, songs, or dance, and we want both existing and new fans, as well as our operator friends, to have only the best experiences when playing our game." This is a premium piece of kit. 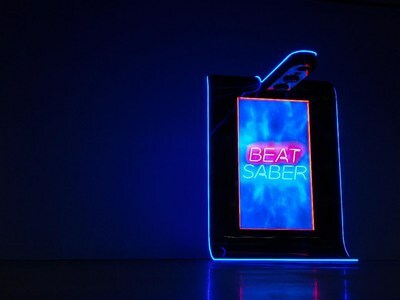 The Beat Saber cabinet's steel frame glistens with neon lighting and strikes a pose like a sleek sculptured piece of modern art. Each cabinet boasts a crowd-drawing 80-inch (203-cm) 4K screen protected by quarter-inch windshield glass displaying everything the player sees in stunning life-size detail. The entire system is powered by HP VR-ready PCs, Intel i7 processors, Nvidia GTX 1080 graphics cards and HTC Vive Pro headsets. The cable management and retraction system provides a near-wireless experience, while the fully integrated ticketing system brings redemption functionality to the table. On top of all of this, the overall unit boasts an impressive 99% uptime record. VRsenal then seals the deal with futuristic holographic signage that projects rotating Beat Saber logos that hover in mid-air just above the cabinet. In short, VRsenal's Beat Saber Virtual Arcade Cabinet is dressed to impress, from the moment you lay eyes on it to the last slash of the last beat of your last song. VRsenal will be at Booth 3886 from Nov 13-16, 2018.